How to make the strings of the Basketball hoop cake. 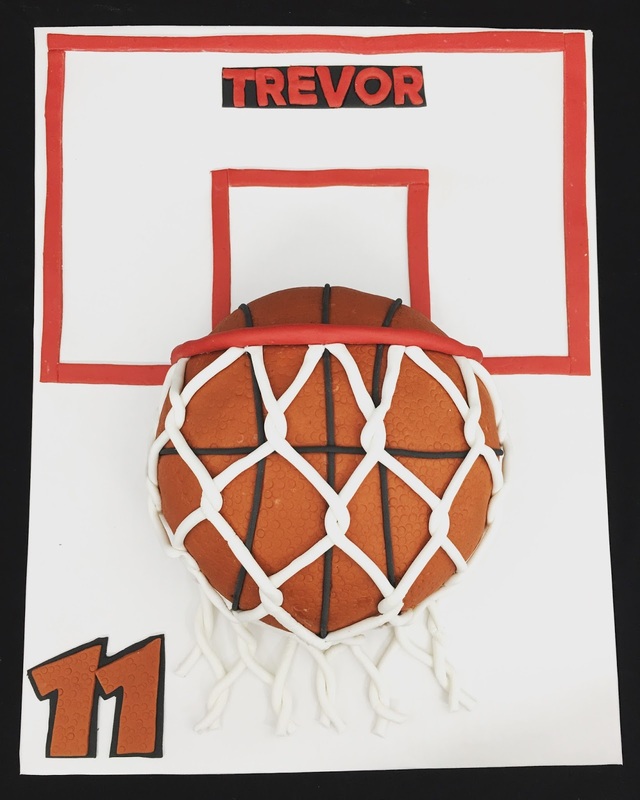 Basketball is a popular sport, so for cake decorators you will probably need to make a basketball cake at least a few times in your career. There are a lot of basketball designs you can do, but this one is super simple and looks more inpressive than just your 3D basketball. The cake actually is super simple to make, yet impressive. Let me show you how! 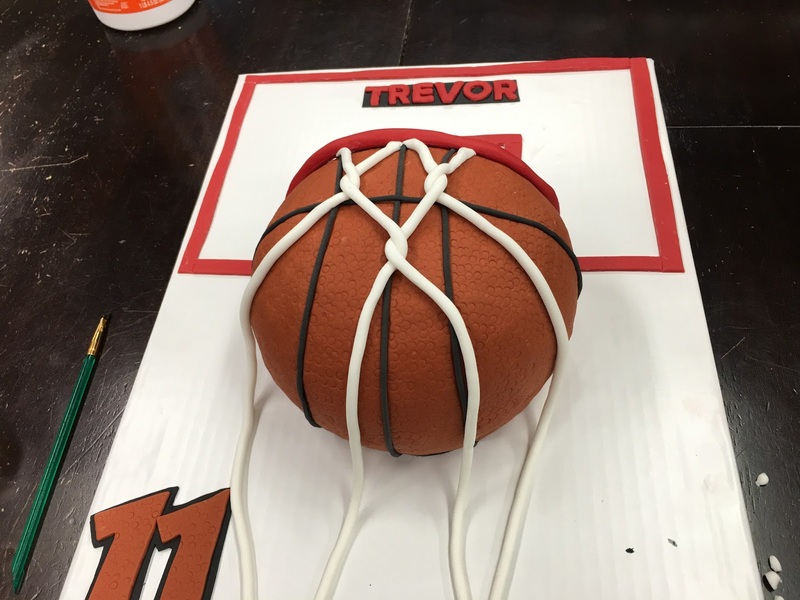 I carved the basketball shape just from 8 inch round cakes, but to make it easier you could use a pyrex bowl to back the top layer so it is already round for you, or use a ball cake pan. 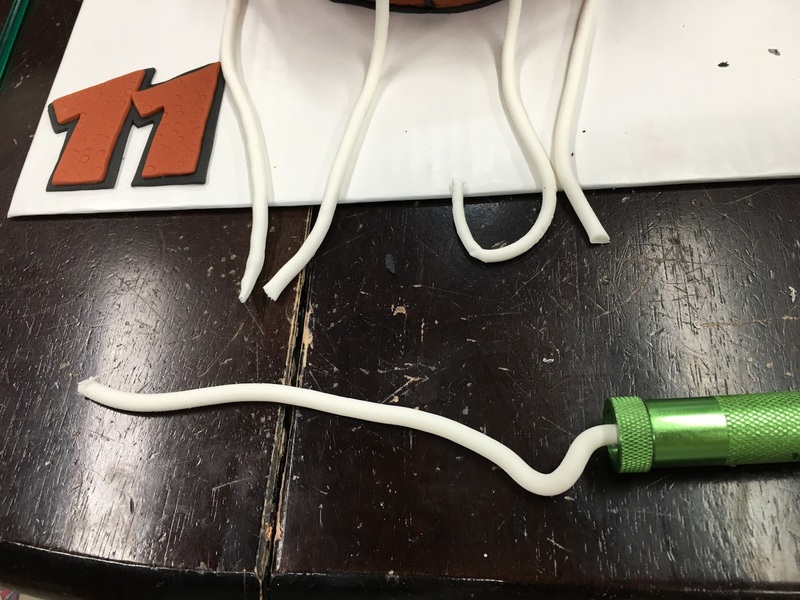 Mark where the black lines on the basketball go and make some black strings with your extruder! That is my secret weapon for this cake!!! With out it I think I would cry rolling out all those strings. This is the extruder that I use Makin’s Professional Ultimate Clay Extruder. It helps me roll uniform strings (and other shapes since there are 20 different tips you can put on it) in a relatively quick manner. And since you need a ton of strings for this cake it is a must! Even with how quick it works put your strings under plastic wrap or in a gallon zip lock bag so they don’t dry out while making them all. For this cake I made 4 Black strings that were about 16 inches long, and 12 white strings that were about 20 inches long. Once the strings are made attach them to the cake under the “rim” and start making the simple twist net pattern. Do the first few center strings then add on strings as you move to each side. For the head board all I did was cut 1/2 inch lines and put them around the board in a back board pattern and add his name and cut out the numbers! So super simple! But couldn’t have done it with out the Makin’s clay extruder! A tool worth it’s weight in gold! And this is my personal opinion. I am not compensated by Makin’s in any way. I do receive a small compensation from Amazon if you purchase through them, but I just use that to help make more tutorials. Previous Previous post: How to get Perfectly Straight Sides on your Cookies! Round, Square, or any shape! Next Next post: Chevron baby shower cake, Marvelous Mold onlay.